Sister Company Awarded for Safety Excellence! The men and women who ensure that workers on Northwest Indiana job-sites make it home safely to their families each night should be considered heroes. There used to be a time, not that long ago in fact, when roughly 11 percent of workers in Indiana were injured on the job each year. Now, thanks to the efforts of safety professionals in the construction and maintenance industries, that figure has been reduced to about 3.5 percent. 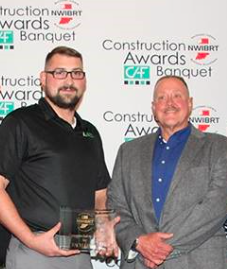 That’s why members of the Northwest Indiana Business Round Table (NWIBRT) come together to celebrate the best-of-the-best in NWI construction safety excellence each year. Their Safety Awards Banquet celebrates the people and companies that demonstrate outstanding capabilities and standards when it comes to reducing or eliminating hazards across a wide range of construction projects and settings. Article source: NWIBRT website. Please visit the site for the full article. Job-Site Safety was awarded with a Safety Excellence Award, yet another year! We are honored to receive such recognition and proudly display this award in our office, as reminder of the work we’ve set out to do on a daily basis: uphold the highest safety standards at the worksite and help mitigate hazards. The Roger Walters Memorial Award is presented to the safety representative that has demonstrated extraordinary contributions to the safety of the workers in Northwest Indiana and beyond. We are extremely proud to announce that our very own, Steve S. Arndt was this year’s recipient of this award! As a seasoned firefighter of the Lafayette Fire Department and a Confined Space Rescue Expert for Job-Site Safety, Steve has not only made safety his career, but his life’s mission. We congratulate Steve for this most honorable recognition!